^ "Cricket scorecard - RPS vs KXIP, Rising Pune Supergiant vs Kings XI Punjab, 53rd Match, Indian Premier League, 2016". Cricbuzz. Retrieved 26 February 2018. ^ "Ravichandran Ashwin ruled out of Indian Premier League 2017". India Today. 31 March 2017. Retrieved 26 February 2018. ^ "IPL Auction 2018: Complete Squad of Kings XI Punjab - Times of India". The Times of India. Retrieved 26 February 2018. 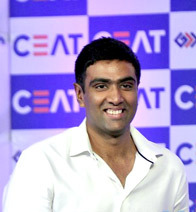 ^ "It's Official: Ashwin named King of Kings". Kings XI Punjab. Retrieved 26 February 2018. ^ "R Ashwin breaks Dale Steyn's record of most wickets in a Test season". The Indian Express. 25 March 2017. Retrieved 26 March 2017. ^ "ICC Awards: R Ashwin wins Cricketer of the Year award". Times of India. 23 December 2016. Retrieved 13 February 2017.